What a perfect book to start the new year with! Although I’ve seen Priscilla Shirer speak in person, I’ve not read any of her books before now. If you enjoy watching Priscilla teach you will like this book. Like most good authors you can hear their speaking voice in their written word, and this was no exception. 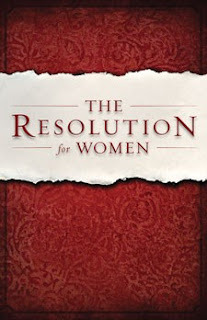 The Resolution for Women was written in partnership with the movie Courageous which is calling men to be stronger spiritual leaders. Priscilla’s book is essentially that same message to women. While all the resolutions are excellent, you may find some challenging to walk out. Certainly, they will cause you to think about some areas in life where you may have gotten lazy. This book is quick read with fast moving chapters that aren’t full of fluff like many of today’s commercial writers. It is thought provoking with encouragement to put the resolutions in practice. I highly recommend The Resolution for Women. It’s great for a small group study or just to share with a friend over coffee. Either way, I think you will enjoy it! Previous PostPrevious LIVING LIFE LESSONS :: What Are You Thinking?